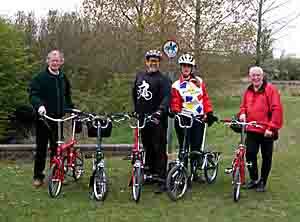 The first Swindon Smallwheels Ride took place on Saturday 20th April 2002. Although there was not much prior warning, and publicity was consequently fairly low-key, it still attracted 5 riders, two on Birdy Reds and three on Bromptons, of which two were the latest 6-speed models. The start point - the Food Hall in the Designer Outlet Village at Swindon - was quite easy to find for those arriving by rail: turn right out of the station and follow the signs to the Designer Outlet Village, which is on the old railway works site, by the railway museum. However, those approaching by car had more difficulty with the road system around Swindon - a good reason to travel by train if you can! After the usual social chat, the bikes were unfolded and we set off via cycle tracks towards some of the new parts of Swindon. Generally this is a rather flat area, but once in the new part of the town, it became a case of making up our route as we went along, and we went, not entirely intentionally, up quite a steep hill to what must be one of the highest spots in the area. Here we found, with excellent timing, a pub for lunch - rather modern looking, with the rather ominous sign outside promising wide screen TV, but in the event the TV was quite unobtrusive, the food good and the service excellent. We may well go back to The Jovial Monk again! Wile we were having lunch we were amazed to see a Birdy Red ride past, and then turn in to the small group of shops by the pub. I rushed out and accosted the rider - a local who just happened to be taking a short ride to fill in time before his lunch - he had no idea that we were having a ride in Swindon, and hadn't even noticed our bikes outside the pub. This brought, if briefly, the number of Birdys up to equal the Bromptons. This was a fairly new Birdy, but not fitted with the new mudguard retention system - instead the owner had made a very simple but effective modification using a thin piece of stainless strip (a recycled stainless band as used for securing temporary road signs etc) screwed to the mudguard and attached to the forks with insulating tape. 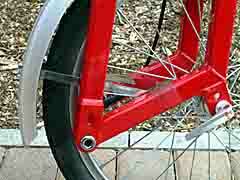 Other rather major modifications were the use of 16 inch wheels with Brompton tyres, and a 44-tooth chainring. A simple but effective way of securing the front mudguard on all but the latest Birdys. After lunch we decided to use the afternoon to ride around getting ideas for future rides. There certainly appear to be plenty of options. One place we visited was the Swindon and Cricklade railway - not yet open, but due to open at the time of the May ride. The car owners were anxious to get back before there was a massive increase in car park charges (after a 6 hour stay), and this fitted in with my need to get a train which would get me back before engineering works meant that my local trains would be replaced by buses. Our timing worked out very well, despite getting rather lost at one stage, and having to indulge in some quite drastic off-road riding. There were faint traces of rain before the start, and once or twice during the ride, but otherwise the weather remained fine. This was a most enjoyable day, and the Swindon Smallwheels Ride is going to be a regular monthly event in future, taking place on the third Saturday of every month (unless this clashes with some major event). I'll certainly be going back. See the events page for further details. Many thanks to Mike Roberts for organising this very successful event, and to those who came to support it.